The Cenozoic Era is divided into the Tertiary (65 to 2Ma) and Quaternary (2Ma to present) periods. The climate of the Quaternary is reviewed in section 5.3. 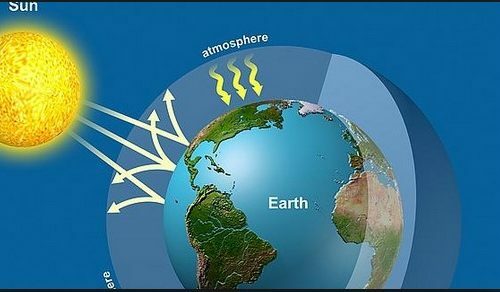 In this section, the climatic deterioration and global cooling of the Tertiary Period is investigated. The ensuing discussion will serve as a useful introduction to the ice age climates of the Quaternary and their orbital forcing mechanisms. Although late Cretaceous temperatures were cooler than the mid-Cretaceous thermal maximum (120 to 90Ma), values remained relatively high into the early Cenozoic. In particular, evidence from oxygen isotope records (Douglas & Woodruff, 1981) revealed that deep sea ocean temperatures were at least 10C to 15C warmer than they are today (see Figure 5.6). Early Cenozoic sea surface temperatures around Antarctica were also considerably warmer than today (Shackleton & Kennet, 1975) . The early Eocene (55 to 50Ma) was the warmest period during the Cenozoic. Various climatic indices suggest that tropical conditions extended 10 to 15 of latitude poleward of their present limits. Eocene tropical assemblages of foraminifera and coccoliths have been found in North Atlantic sediments (Haq et al., 1977). Vertebrate fossils of alligators and flying lemurs have been found from a site on Ellesmere Island, west of Greenland (Dawson et al., 1976). It has been suggested that the early Eocene warming may have resulted from an increase in atmospheric CO2, due to a significant reorganisation in tectonic plate motion, as North America separated from the Eurasian plate (Berner et al., 1983). Unfortunately, little proxy evidence exists to test this premise. During the late Eocene and Oligocene Epochs (40 to 25Ma) a transition occurred between the warm periods of the early Cenozoic and the cold periods of the later Cenozoic. Antarctic glaciation may have been initiated at about this time. Evidence of ice-rafted debris in the Southern Ocean has been dated at 34Ma (Hayes & Frakes, 1975). Changes in equatorial Pacific planktonic and benthonic 18O records suggest that considerable and rapid continental ice formation was taking place at this time (Keigwin, 1980). Another significant cooling transition occurred during the Miocene (15 to 10Ma). A dramatic increase in the 18O record between 14 and 15Ma has been interpreted both as the rapid growth of the Antarctic ice sheet (Shackleton & Kennet, 1975) and a deep water cooling event (4 to 5C) (Moore et al., 1987). Both the Oligocene and Miocene cooling events reveal themselves in the sea level record in Figure 5.7 (Haq et al., 1987). The rapidity of these falls in sea level precludes the possibility that changes in ocean bathymetry were the cause. Rather, increases in continental ice volume must be proposed. 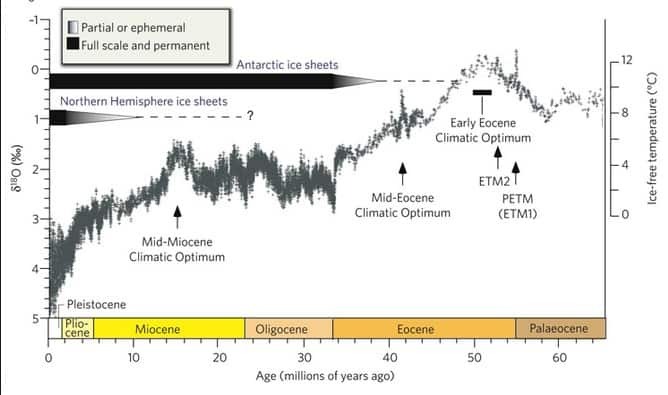 The exact timing of the onset of mid-latitude Northern Hemisphere Glaciation is uncertain, but some oxygen isotope records suggest a date towards the end of the Pliocene (3 to 2Ma). Variations in planktonic abundances indicate that large changes in sea surface temperature were occurring prior to 2.4Ma (Raymo et al., 1986) whilst ice-rafted debris from the Norwegian Sea has been dated at 2.8 to 2.6Ma (Jansen et al., 1988). Northern Hemisphere glaciation proceeded throughout the Pleistocene (Quaternary Period) and continues today. Much scientific work has been devoted to the analysis of the Pleistocene glaciations; this is reviewed in the next section. In the meantime, however, one issue remains unresolved. What was the cause of the Cenozoic climatic deterioration? A number of hypotheses have been proposed to account for the Cenozoic cooling. Changes in land-sea distribution have been extensively modelled using GCMs. However, the increase in high latitude land masses (with initiation of ice-albedo feedbacks) and the decrease in continentality (with accompanying decreases in seasonality and summer temperatures) do not seem to account for all of the temperature changes (Barron, 1985). Variations in ocean circulation due to changes in continental positions have also been considered as a causal mechanism for Cenozoic climate change. Indeed, geologists have long been interested in the effects of ocean gateways (between two continental land masses) on past climates. Experiments with ocean circulation models (Seidov, 1896) also indicate that changing continental position can have a significant effect on ocean heat transport. At the beginning of the Cenozoic a circum-equatorial seaway existed (the Tethys Sea) that spanned the entire Earth. Equatorial currents flowed unimpeded several times around the globe before diverting north and south. Waters in this equatorial seaway would have experienced considerable heating, resulting in a more even distribution of warmth across the latitudes. 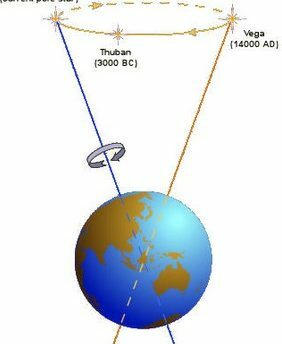 As the continents continued to separate the Tethys Sea gradually closed, cutting off the circum-equatorial currents. Latitudinal heat transport was thus reduced. During the late Eocene and Oligocene, the Gondwanan continents fully separated, and by 25 to 30Ma, the opening of the Drake Passage between Antarctica and South America allowed the formation of a circum-polar ocean flow (Figure 5.8). With heat transport effectively cut off from the high southern latitudes, the latitudinal temperature gradient increased and glaciation in the Southern Hemisphere ensued. Changes in continental topography during the Cenozoic has been proposed as another cause of the long-term climatic deterioration. Specifically, model simulations suggest that uplift of the Colorado and Tibetan Plateaux initiated winter cooling of North America, northern Europe, northern Asia and the Arctic Ocean, as a result of atmospheric circulation changes (Ruddiman and Kutzbach, 1989). Accompanying the global escalation in orogenic uplift (during a period which witnessed the building of the Alpine and Himalayan mountain chains) was an increase in the rate of weathering of silicate rocks (Raymo et al., 1988). 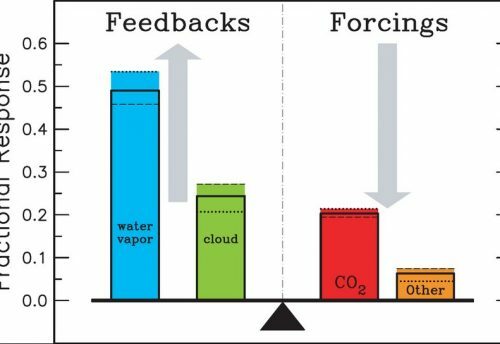 CO2 is removed from the atmosphere during this geochemical process (see section 2.6.1). Cenozoic mountain building may therefore have indirectly reduced the greenhouse forcing of the Earth-atmosphere system, enhancing global cooling. It was recognised in earlier sections that atmospheric CO2 concentration was probably several times greater than at present, but little reliable proxy data exist to constrain the timing and magnitude of the postulated fall in pCO2. In summary, it is likely that a combination of processes – changes in land-sea distribution, ocean heat transport, orography and CO2 – are involved in the long-term evolution of the Cenozoic climate, and probably the climates of the earlier Phanerozoic. These processes operate over time scales involving tens or even hundreds of millions of years. It is evident that model simulations are sometimes in disagreement with the proxy climatic records, whilst the validity of such records may often be questioned. If a thorough and unequivocal reconstruction pre-Quaternary climates is to be achieved, these problems will need to be addressed by future researchers in palaeoclimatology.